Why choose an immersion blender over of a traditional blender? Immersion blenders allow you to blend in much larger capacities in whatever container you choose. In addition, variable speed Immersion blenders also allow the operator complete control over the consistency and chefs need this when they’re creating foams and sauces. Immersion blenders are also efficient when it comes to refreshing or pulsing a large batch any mixture right in the container you are storing it in. As opposed to having to pour a mixture back into a blender jar. Traditional blenders create a different type of vortex with how the blade movement and jar shape interact, allowing them to perform better on tasks such as blending iced drinks quickly. Not just around the kitchen but for caterers and foodservice applications that need to mix and refresh foods offsite. With a cordless unit, the carrying case makes it perfect for chefs to take with them. 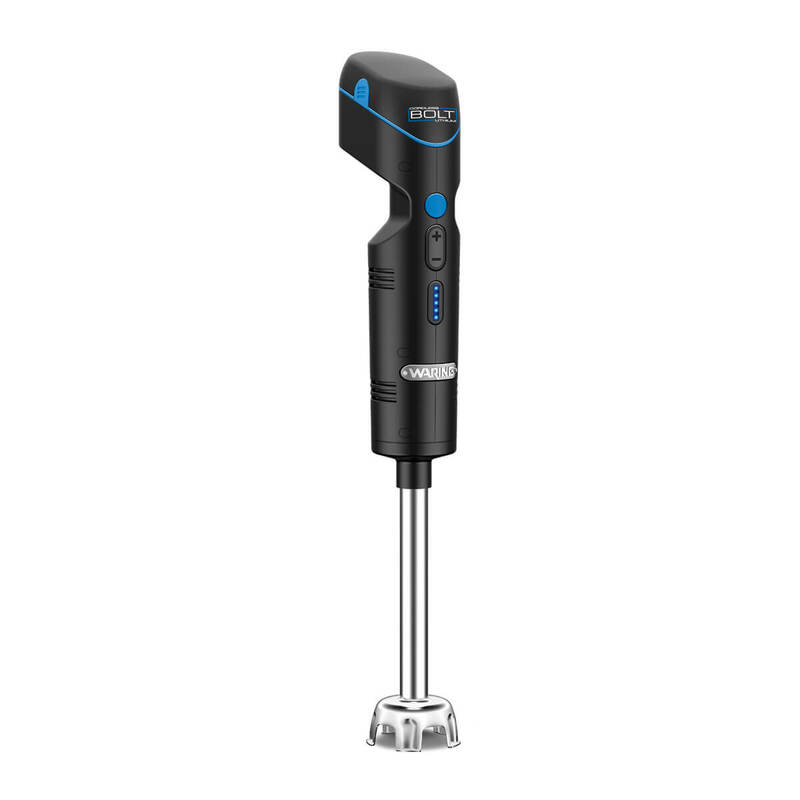 What is the first thing to look for in a commercial immersion blender? When shopping for an immersion blender, first look at the application your commercial kitchen needs it for. In general – this means Light-Duty vs. Medium-Duty vs. Heavy-Duty blending. Small volume of light sauces like vinaigrettes, salad dressing, purees, mayonnaise. Light-duty immersion blenders typically have short shaft lengths and are used in smaller mixing bowls or containers around 3 gallons. When you require more capacity but also need to blend heavier things like guacamole, whipped cream, salsa, tapenade. Going from light-duty to medium-duty immersion blending will depend on the mixing capacity required. So, once your mixing container gets over 10 gallons, you should consider the next step up into heavy-duty. High volume food production at a much larger capacity. For example, you can blend 50 pounds of mashed potatoes in one minute with Waring Commercial’s Big Stix® Immersion Blenders. In addition, heavy-duty immersion blenders typically have much longer shafts and mixing capacity can go up to 50 gallons. 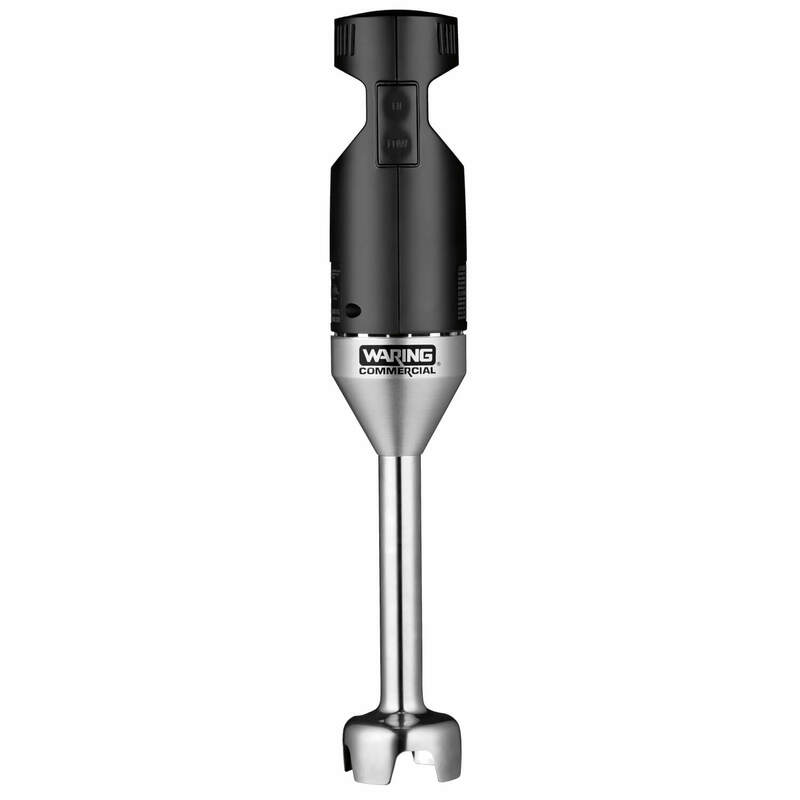 The Quik Stik Immersion Blender by Waring Commercial is the perfect entry-level immersion blender engineered for low volume processing. How do speeds and power factor into immersion blenders? Waring immersion blenders go from 7,500 RPM to 18,000 RPM. But what does the RPM (Revolutions Per Minute) mean for application in your kitchen? 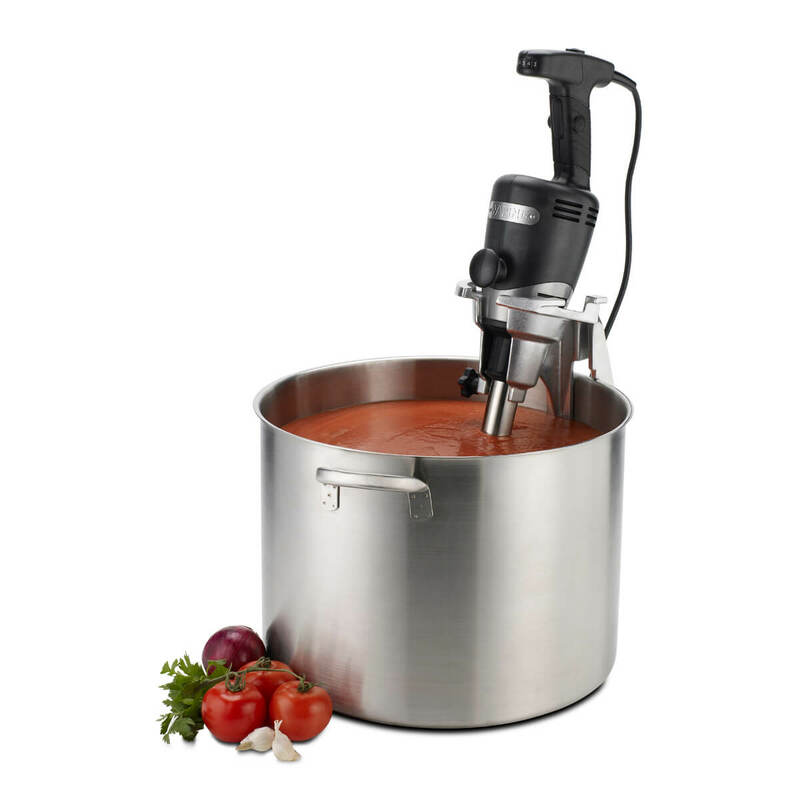 Blending at 7,500 RPM is for the light-duty applications like vinaigrettes and purees. Blending at 18,000 RPM is necessary for heavy-duty applications like whipped cream. And the higher end of RPM is also important for longer, continuous use. The horsepower of immersion blenders corresponds to the amount of power required to get the job done, which depends on the thickness of the product. 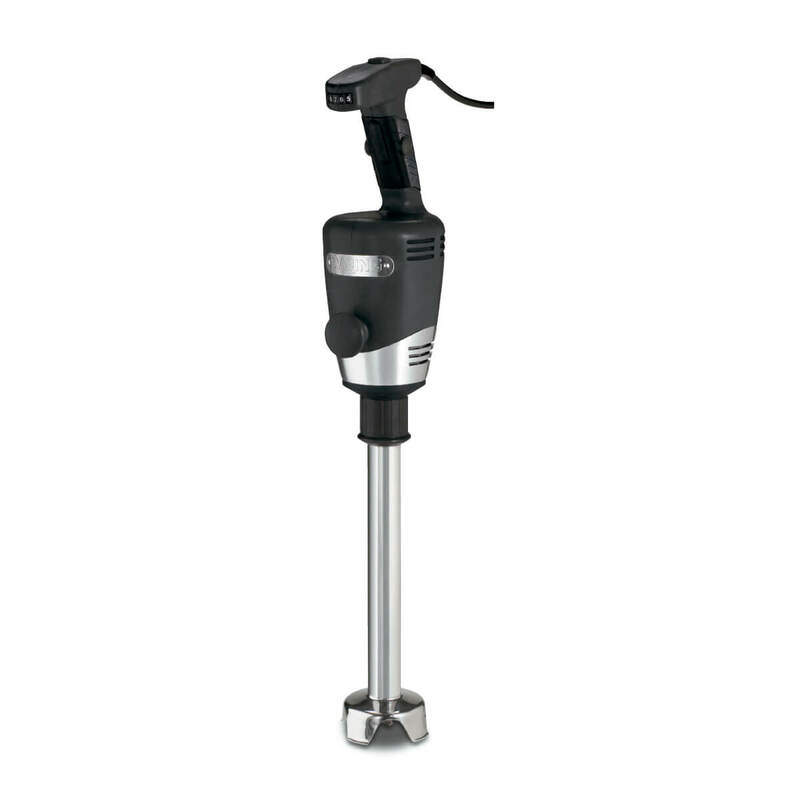 Medium-Duty immersion blenders require ½ HP while Heavy-Duty units require 1 HP. What’s the benefit of a removable shaft? Cleanability is the biggest benefit of a removable shaft on an immersion blender. Waring’s patented removable shaft is sealed all the way through from one end to the other. This means that when the shaft is placed in a sink or commercial dishwasher, water won’t get inside the unit. Water entering the immersion blender shaft means it can sit and become a food safety risk as well as spilling out into the food as it’s being prepped. This also makes Waring’s removable shafts NSF-certified, a necessity for commercial kitchens. Aside from water penetration, a key failure point on immersion blenders is where the shaft attaches to the gears, which can ground out over time. Waring Commercial’s Big Stix® Immersion Blenders are made with a field-replaceable coupling kit that’s simply one small item to replace instead of replacing the whole unit. Waring Commercial’s Big Stix series have interchangeable shafts so chefs can easily swap between jobs. Why choose a cordless immersion blender? Cordless immersion blenders are designed to be both lightweight and ergonomic for ease of mobility or where kitchen space is limited. And cordless is the way to go for mobile kitchens (like food trucks) and caterers who need to blend offsite. 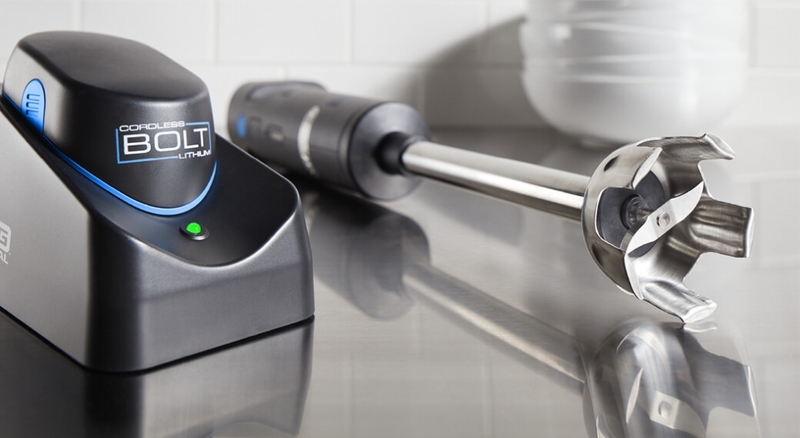 With a 7-inch removable shaft, 10.8-volt lithium-ion battery, and variable speed – the medium-duty BOLT® Cordless Immersion Blender is a solid choice for professional speed, power, and performance anywhere in the commercial kitchen. Do heavy-duty immersion blenders by Waring Commercial have extra features to make them easier to use? Rubberized comfort grip and patented second handle help the user easily control and comfortably operate the immersion blender for extended periods of time. Bowl clamps allow hands-free operation, which also lets the user briefly step away while it continues blending. Wall hooks make for convenient storage for the immersion blender while not in use. The bowl clamp in action, allowing easy hands-free operation for Waring Commercial’s Big Stix series. How do you care for immersion blenders? ❌ Never submerge the shaft more than three quarters – otherwise food can get inside the motor. ✔️ Clean immersion blender shafts immediately after use. With fixed shafts units, all it takes is hot soapy water. 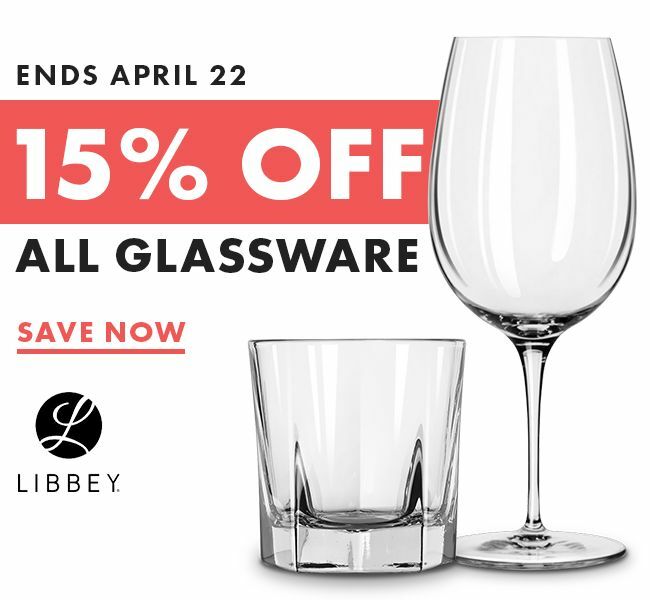 In contrast, with removable shafts, it just needs to be detached and put into the dishwasher. ✔️ Only use the proper duty blender for the application at hand. Using a light-duty blender on a product that’s too thick will damage the motor. This is a sponsored post by Waring Commercial.